In the past I viewed discipline as a kind of iron-fisted dictator living in my brain. It would bark orders at my body and I’d follow through with those orders perfectly. Having an iron-fisted dictator has its advantages in life. It makes it easier to study. When you don’t have a choice of whether or not you’re going to study, you don’t have to think about it. You just do it. Being told what to do is easy. Living with that iron-fisted dictator allowed me to boost my grades dramatically whenever I wanted. It never really fulfilled me though. I would always have this incomplete feeling whenever I succeeded. It would be nice but I always felt that I was missing some of the pleasure. The credit for my success seemed to go towards the iron-fisted dictator in my brain. I would get caught up thinking that following those orders blindly is what led me to my success. I almost lost track of the fact that I’m the one giving those orders. I couldn’t blame anyone for being satisfied living with a dictator style discipline. It works. These days I tend to prefer a more nuanced view. I think of my brain more like a republic. Discipline is more like a general. When the general barks an order, the troops fall in line. The general can’t just bark orders randomly though. The general needs permission from the republic. My bones, my muscles, my head, and each individual part of me has its own representative in my brain. If I were considering studying when I had a fever, different parts of me would have different opinions about whether or not to study. My brain might think “Yea. I could study,” while my body is saying “I will constantly distract you from the study material.” The votes are all cast (through more of a trusted feeling than literal voting,) and the decision is made. If the studying is approved then the general steps in to make sure everything gets done. Ultimately, this is just a feeling. It’s all just a different kind of feeling. Discipline isn’t just doing what you need to do. Discipline is also having the discipline to not do something when it’s not the right time for it. It’s a great tool for procrastination but it is possible to use it responsibly. That’s incredible. 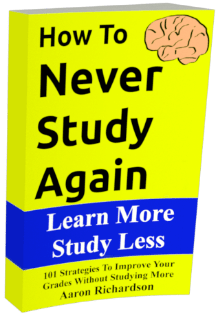 I had no idea that some people are so disciplined that giving up studying for a while might be incredibly difficult for them. I learn something new everyday. I wish I had this kind of problem instead of the opposite! You are a talented writer. I really liked the dictator metaphor. Looking forward to reading more of your posts!